A yoga strap is an amazing prop! It can be used in supine poses to create freedom and space in the hips and back, in standing poses to clarify the sense of direction and action, and even in inverted poses and backbends to provide support and help us stabilize. It has benefits both when we need to modify our practice and when we want to find ways to deepen it. In this playful workshop we’ll explore the many creative ways in which this prop can enhance the practice and teaching of yoga. 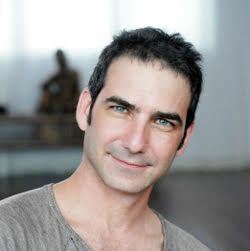 Tzahi Moskovitz, E-RYT500, discovered yoga between rehearsals early in his acting career and soon trained in New York City at Be Yoga, which later became YogaWorks. With his focus and skill, he quickly became a senior teacher trainer there. Another senior teacher urged him to take an Iyengar class, and he was struck by its effects on his body and mind—it was a perfect fit. After completing a rigorous two-year Iyengar teacher training program at the NYC Iyengar Institute and spending a month in 2012 with the Iyengar family in Pune, India, Tzahi is now a certified Iyengar Yoga teacher. His primary teachers are Mary Dunn, James Murphy, and Carrie Owerko. Renowned for his clarity and humor, he loves sharing yoga and enjoys observing his students make their own discoveries. Visit Tzahi at tzahiyoga.com.